Meet the Witches of Secret Hallow: A hidden village populated by friendly witches, their familiars, and a smattering of ghosts, ghouls, and elemental spirits. Rowan is a witch, although you wouldn’t know it. She hates to use her magic and has abandoned the place that she grew up in, ‘Secret Hallow’, because she doesn’t like to use her craft. When Rowan is called back to the village by her grandmother, who needs her help to save the Elder Tree, and to stop ‘Secret Hallow’ from losing it’s magic, Rowan feels like she has no option but to return. What her grandmother wasn’t expecting though, was Rowan to try to help in a non-magical way. Can she save them all without having to resort to using the one thing she hates about herself? 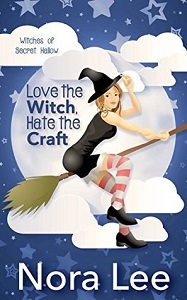 I love a bit of witchcraft (I don’t know if you could tell by the logo for the blog! ), so I was intrigued and excited to get my teeth into this book. The story though wasn’t exactly what I was expecting. I was expecting action, magical moments, bad guys, a fight to save the tree. What we actually get is a sweet story about a witch trying her best to help her ageing grandmother. I also expected the Elder Tree to have a bigger part in the story, seeing as though that was the reason that she returned home, but the tree plays a secondary role to Rowan herself. The book mainly is about Rowan, well, just being Rowan and getting on with her life. Meeting her friends and family and failing to use her magic, even when it is needed. There is however a bit of a love story to the book too, as well as a non-starter love triangle (all one-sided on the warlocks behalf). The book reads very easily and much like a YA book (that’s why I’ve put it in the YA category as well). The story is lovely, but I was really hoping for a bit more oomph and depth to it. There was one bit about the book that really narked me though. Rowan’s grandmother never called her by her name. She called ‘grand-daughter’ every time she spoke to her. Now I don’t know about you, but my grandparents have always called me by my name, not ‘grand-daughter’ when speaking to me. It is an interesting, fun book, but I think this would suit someone around 12-15, more than an adult.